The theatre at Oldham library is a compact ampitheatrical space with the semi-circular performing area on floor level and the audience on a set of risers on one side. With this in mind, there should never be any sight issues, and the audience should always be able to see everything without difficulty. Not this afternoon. 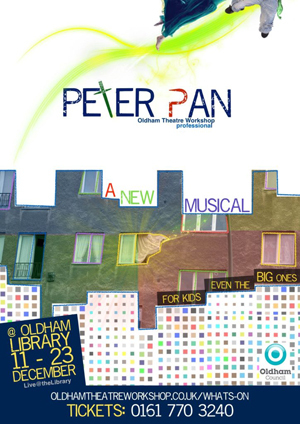 This afternoon I was present to see Oldham Theatre Workshop's presentation of Peter Pan. Oldham Theatre Workshop is a local institution, and a byword for excellence in youth drama training. Started by David Johnston way back in 1968, the company take students from 6 years to young adults, and have their own studio next door to Oldham's library. It has been a long time since I saw a production by these talented youngsters, and so I was looking forward to what they could do with the well-known and perhaps tired story of Peter Pan. Sorry, I realise I have been waffling, let me get back to the audience visibility. The set took up the majority of the available stage space, and although it was used effectively, it meant that anything performed actually on the floor, such as the two children in bed at the beginning, or where they crouch down at the front of the stage, they are immediately blocked from view for those sitting past the first few rows. That was such a shame. If they could have pushed the platform back by about one metre it would have been ideal, but of course, there wasn't room to do this. Back to the story. This was an adaptation of the famous John Barrie novel by Sarah Nelson, and although she used only 5 main actors, she stuck very closely to the original story where a young brother and sister living in suburbia are visited by a boy who simply hasn't and refuses to grow up, Peter Pan. He can fly and lives in Neverland with all the lost boys; and regularly does battle with the pirates who also live on the same far away island. Wendy and John (the two children) are persuaded to travel back with him, and Wendy becomes the boys' surrogate mother and tells them stories, whilst John and the boys go on adventures and battle the pirates. Eventually the pirates capture them all, they rescue each other, and leave the pirates to the fate of the crocodile, and then Wendy and John fly back home. Years later, Peter pan visits Wendy again, only this time she is married and has a young daughter herself, and so Peter takes the daughter off and the cycle starts again. Oh and there's a fairy in there too - a certain Tinkerbell who is jealous of Peter's relationship with Wendy, but proves her love is true by being prepared to die for him by drinking the poison instead of him. The moment Peter asks the audience to clap if they believe in fairies was a very nice one which could have been developed a little further since it was the only part of the play with audience interaction. Jabez Sykes was a very confident and pleasing Peter Pan. Gone was the childish petulance, and in its place something much more real, giving his character more gravitas and earnestness. I liked that. Natasha Davidson played Wendy, again with much more candidness and maturity than she is normally portrayed and this worked in her favour. Whilst Madeleine Edmondson's peevishness was in perfect apposition. Sophie Ellicott played the dual roles of Mrs Darling and Captain Hook with skill. The hardest job, however, and therefore the most credit, must go to Daniel Hartshead who managed to play both John and Smee with almost seamless transformation - going from an eager wide-eyed young boy to a nasty pirate's mate and back with nothing more than a change of cloak. Excellently measured. The play though is too long. For the target audience, and the style of show, I would advise making it into a one act production with no interval and making it last no more than 70 minutes. The audience were visibly fidgeting far more in the second act. There were several original songs in the play too, written by the director, James Atherton, and although I really enjoyed listening to them, and the harmonies were beautiful and spot on every time, they were all very samey, and perhaps not catchy and pop-like enough to really engage the target audience. The stage fighting however was superb. I loved the slow motion sequences and the idea that contact had been made despite being on opposite sides of the stage. There was humour in there, only a little, but it was there; what a shame then that there wasn't more humour throughout the play, and it would have engaged the audience far more and quicker had there been some visual gags throughout the show. In summation then; a lovely idea, excellently acted and sung, but too long and not fast-moving or comedic enough to fully engage the audience.